The Sinclair QL ("QL" stands for "Quantum Leap") was released in 1984. The basic model got a 8 MHz 68008 processor, 128 Kb of RAM, 48 Kb of ROM, two "microdrives" (looped tape cartridges with 100 Kb storage capacity) units and a 512x256 pixels screen in 4 colours or 256x256 in 8 colours+flash mode. Its operating system is the QDOS, a single user preemptive multitasking system (the QL was the first personal computer in the world with a multitasking OS !). The Gold Card (Miracle systems): 16 MHz 68000, 2 Mb of RAM, DD/HD/ED floppy I/F, CENTRONICS port. No more in production. The Super Gold Card (Miracle Systems): same as Gold Card but got a 24 MHz 68020, 4 Mb of RAM and a parallele port. Because of an outdated GLUE locic chip, the SGC is no more built but it is still possible to find second hand cards. Qubide (QubbeSoft): AT/IDE hard disk interface. No more in production. Super HERMES (TF services): a new co-processor replacement for the buggy 8049. SuperHERMES is based on the RISC PIC17C44 processor and cures all the 8049 bugs while adding many new features: high speed serial interface (up to 19200 bps on ser1 and ser2, up to 115200 bps on the new ser3 with DCD, DSR and DTR support), IBM keyboard interface, serial mouse interface, plus many others small goodies. No more in production. 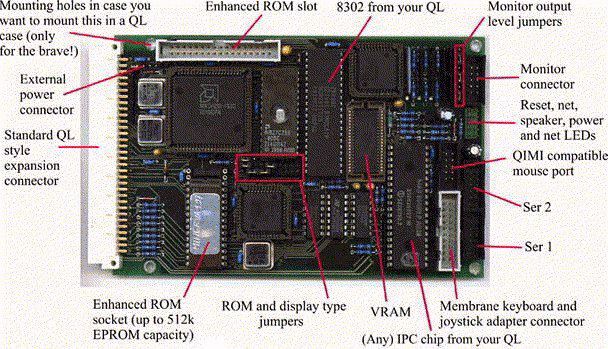 The "Aurora" card (QubbeSoft): this graphic card is in fact a replacement card for the QL motherboard. It can display up to 256 colours with resolutions up to 1024x768 (SVGA). No more in production (again because of an outdated GLUE chip...). Thor computers were built by CST and took over the QL when Sinclair Research Ltd was bought by Amstrad. The Thors 8, 20 and 21 were based on the original QL motherboard surrounded with, depending on the Thor model, one or two 3"1/2 floppy disk units and one SCSI hard disk (RODIME 20 or 40 Mb), the whole thing being encased into a proper metal case. Thor 20 and 21 got a 68020 in place of the 68008. The Thor XVI was a new machine (new motherboard with 16 bits data bus, 512 Kb of RAM expandable to 3 Mb, 128 Kb of ROM) with a 8 MHz 68000 as the main processor, one or two floppy disk units and one optional SCSI RODIME hard disk (20 or 40 Mb). The Thors' operating system is ARGOS. The Thor computers are no more in production. 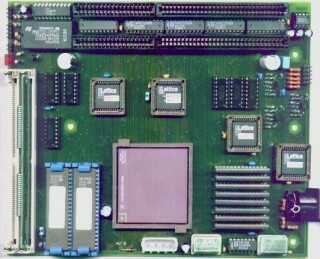 This is a standard 8/16 bits ISA card for IBM PC compatible computers. It got a 20 MHz (QXL) or 25 MHz (QXL 2) 68EC040 and 2 to 8 Mb of RAM. "Miracle Systems" idea was simply to use the hardware of a (vulgar) PC to serve a (magnificent) 68040 in order to run a QDOS compatible operating system (SMSQ or SMSQ/E). The result is quite good, even if we can have some regrets about the design of the QXL to PC interface (just one 8 or 16 bits I/O address) that slows down the exchanges between the QXL and the fast peripherals (mostly screen and hard disks). The QXL supports the QL (512x256), VGA (640x480), SVGA (800x600) and (new !) XVGA (1024x768) video modes with 4, 8 or (new !) 65536 colours thanks to the new GD 2 (Graphic Driver level 2). I personally got two QXL cards (turbo ones using full blown 68040 with 33.333 MHz (=20 Mips) and 35 MHz (=21 Mips) clocks !). The QXL is no more in production. These card are available with three (!) operating systems: SMSQ/E (with 65536 colours graphic modes support), QDOS "Classic" (a QDOS derivative used in the QL emulator for Amiga) and... Linux ! Q40: 68040 at 40 MHz (with MMU and FPU). Q60: 68060 at 66 MHz (with MMU and FPU) or 68LC060 at 80 MHz (with MMU but without FPU). Two SIMM modules (72 pins) sockets for EDO or FPM RAM (4 to 32 Mb of RAM in all for Q40, up to 128 Mb for Q60). 256 Kb ROM (expandable to 1 Mb). 1 Mb of dual ported video RAM (the processor access it without waiting for video refresh). QL-compatible screen and expanded screen modes (512x256 in 4/8 colours and 1024x512 with 65536 colours). MF-II keyboard interface (standard PC keyboards). Sound output (D/A converter sampling rates: 10 or 20 KHz). Battery buffered clock with 2 Kb SRAM. E-IDE controller for 2 hard disks, floppy disk controller for 2 DD or HD units, 2 serial ports (115200 bps), 1 parallele port and 1 joystick connector (all on one ISA I/O card). One ISA expansion connector available (although not all ISA signals are available: DMA access is not supported by the Q40). The Q40 was sold by TF services and Q Branch. Only a very small number of Q60 cards have been produced. Follow this link for even more details about these magnificient cards. What I call a "QL emulator" is a software that allows to run a QDOS compatible system on a computer that does not get the original (in the full acceptation of the word !) Sinclair QL architecture. 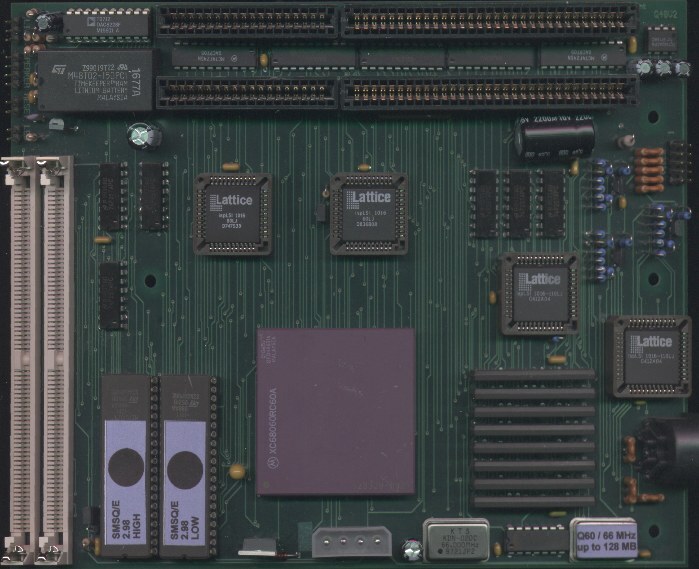 Those which "emulate" the original QL hardware on a 680x0 based computer: they often just consist in a re-write of the QDOS drivers. Those which fully emulates the QL (including the 68000 processor, which emulation consumes many time...). The QL emulator for ATARIs (ST or Mega ST): made by Jochen Merz Software, it was using (it is no more in production) a small auxilliary circuit in order to mimic the QL video modes. SMS2: a QDOS "compatible" operating system for Atari. It only used the Atari monochrome 640x400 resolution but did not need any additional hardware (commercial software, no more available). Author: Tony Tebby. SMSQ/E: a QDOS compatible (95%) operating system that runs either on all ATARIs (but the Falcon) without any additional hardware (640x400 monochrome mode), or on VME bus (or VME adaptor) fitted ATARIs together with the QVME video card (made by Jochen Merz Software) offering QL resolutions and up to 1024x768 in 4 colours. SMSQ/E is a commercial software. Author: Tony Tebby. QLem: a patched QDOS that runs on any Atari computer (Falcon included) but which stays in a very rudimentary state (freeware, author: Johan Klockars). The QL emulator for AMIGAs: a patched QDOS, recently named QDOS "Classic" that runs on any Amiga computer without any additional hardware (freeware. Author: Mark J. Swift). QemuLator: a QL emulator for (Power)MACs written in C (shareware). An assemby written version is available for some MACs. A Windoze version is also available. Author: Daniele Terdina. UQLX: a QL emulator for UNIX, a derivative of Qemulator, that was developed by Richard Zidlicky. UQLX could also be compiled for OS/2 ! QPC and QPC II: QL emulators for x86 PCs under Windows (but QPC II also runs fine with Wine under Linux). Written by Marcel Kilgus and now freeware (for v1 and v4) ! They run SMSQ/E. The 68000 emulator is written in 486 assembly language, which ensure good performances for a purely software based emulator..
QLAY: a QL emulator for PCs, somewhat slow and rudimentary (no true foreign keyboard support, no true polled interrupts, etc...) but free, now runs under DOS/Windoze as well as under Linux. Author: Jan Venema. SMSQmulator: a QL emulator running SMSQ/E under Java (meaning it can run on pretty much any modern computer ! ), actively developed by Wolfgang Lenerz. (c) 1996, Thierry Godefroy. No warranty or whatsoever is given regarding the accuracy of the information contained in these Web pages.